Win the day with full PC performance and unleash creativity with the freedom of a tablet. Superb typing experience with best-in-class Travel keyboard. Utilize the full-size Wacom pen and digitizer. Transfer data quickly, and connect to 4k devices with the USB-C™ port. In the modern working world, portability is everything. You need a device that can match your schedule and meet your needs by providing flexibility, versatility, and the performance to keep your projects running smoothly. Experience heavy-duty processing combined with convenience and portability with a laptop tablet by HP®. In addition to giving you all the power you need, this range of devices allows you to easily switch between modes to ensure that you have the right tools to adapt to an ever-changing workday. With affordable, effective, and stylish devices available, we’re confident you can find the perfect fit to get you through the day. Engineered to provide the pinnacle of on-the-go performance, the HP Elite x2 1012 is a revolutionary solution with all of the features you need to maximize your productivity. You’ll be ready for whatever the work day brings with a device that blends the convenient functionality of an HP tablet with the processing power of the 6th Generation Intel® Core™ M series. Featuring a slim and modern design complete with a stand and detachable keyboard, you can effortlessly switch between modes of use to match the changing requirements of your schedule. Enjoy the comfort of a best-in-class mobile keyboard to hammer out memos, documents, and reports, then seamlessly switch to tablet mode for hands-on control. The durable Corning® Gorilla® Glass-reinforced display means that you can count on the HP Elite x2 1012 to stand up to most environments and work sites, allowing you to achieve your goals like never before. 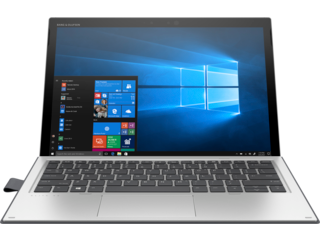 Make sure that your work is safe and virtually untouchable with a 2-in-1 that prioritizes security, inside and out. Equipped with innovative features including a smart card reader, an optional fingerprint reader, and HP Sure Start Gen3, the HP Pro x2 612 tablet makes sure your data and work will be secure. This laptop tablet is just as safe on the outside thanks to a frame that stands up to military-grade standards to resist dust, certain levels of impact, and other nagging issues that would normally slow down a device. 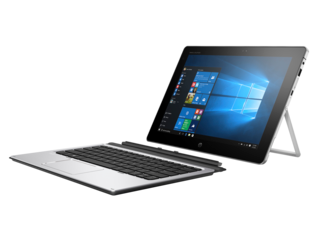 The HP Pro x2 612 is an HP windows tablet that utilizes the latest operating system, Windows 10 Pro 64, in addition to a powerful Intel® Core™ m3 processor to deliver a responsive, reliable, and consistently excellent experience. Take advantage of a detachable notebook that gives you the power and security to stay ahead of the game, no matter where you work. Balance your workday and be ready to adapt to anything with notebooks that ensure you always have the right tools for the job. You’ll go anywhere with confidence when you use a laptop tablet equipped with the latest security and performance features of a notebook and the hands-on creativity of a tablet. Discover how your workday can be reinvigorated with a 2-in-1 notebook perfected to handle even the most demanding tasks.